Heat oven to 400°F. Line large cookie sheets with cooking parchment paper. Unroll pie crusts on work surface. Using 2 1/4-inch round cookie cutter, cut 20 rounds from each crust, rerolling dough if necessary. Place on cookie sheet; prick each round twice with fork. In small bowl, beat egg and 1 tablespoon water until well blended; brush on rounds. Sprinkle with sea salt. Bake 7 to 10 minutes or until golden brown and crisp. Cool while preparing bacon. Line 15x10x1-inch pan with cooking parchment paper. In small bowl, mix brown sugar and red pepper. Place bacon with sides touching in pan; sprinkle with brown sugar mixture. Bake 10 to 15 minutes or until sugar is hot and bubbly. Remove bacon from pan to a plate; let stand 10 to 15 minutes or until cool enough to handle. Using sharp knife, cut each bacon slice into 4 pieces. Meanwhile, in small bowl, mix 1/2 cup water, granulated sugar and lemon juice until sugar is dissolved. Cut each unpeeled apple into 20 (2x1/4-inch) slices; place in water mixture and refrigerate. In another small bowl, mix cream cheese and blue cheese with wooden spoon, leaving small pieces of blue cheese visible. Spoon mixture into pastry bag fitted with 3/4-inch tip; pipe onto each cracker. Drain apple slices; pat dry. 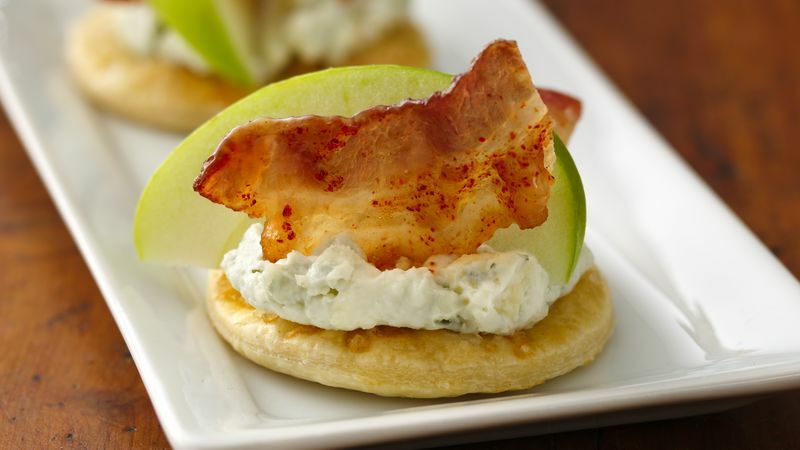 For each cracker, place 1 apple slice between 2 bacon pieces; press at an angle into cheese mixture. If a pastry bag is not available, use a 1-gallon resealable food-storage plastic bag, cutting a 3/4-inch tip from one corner.